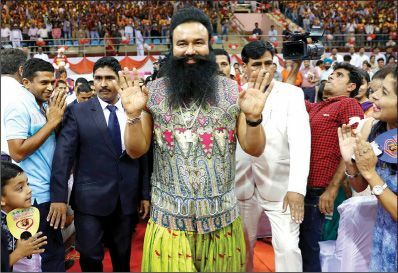 To nondevotees, the self-styled “baba of bling” seems ridiculous, all decked out in his beloved rhinestones and sequins, said The Indian Express. Singh is not just a holy man; he’s an entertainment industry. He’s released six albums of high-energy pop, the most recent of which, Highway Love Charger, sold 3 million copies in three days. Singh’s movies—in which he is credited as writer, director, actor, and musician—portray him as part motorcycle-riding action hero, part divinity. He calls himself “messenger of God” and is politically powerful in Haryana state, where his support was crucial to the victory there of the ruling Hindu nationalist Bharatiya Janata Party. His sprawling sect headquarters is “like a township,” with dorms, factories, and a hospital, all run by his followers. Where we see a narcissist, those women see a genius with “supernatural powers”—no wonder Singh could prey on them so easily.